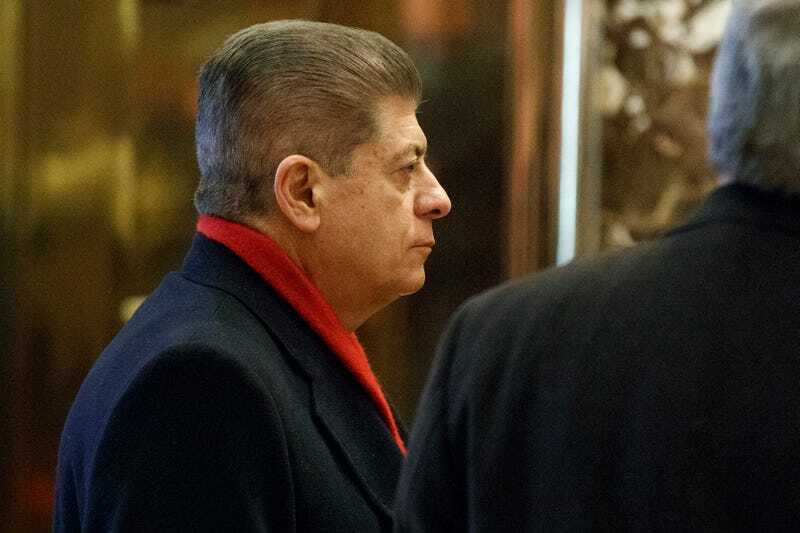 Andrew Napolitano is a fixture of Fox News who calls himself “Judge Napolitano” because he was a New Jersey Superior Court judge two decades ago, so it comes as no surprise that he takes himself more seriously than anyone else does. Politico reported on Saturday that, after meeting with President Trump in December and then again in mid-January, the legal analyst became convinced that he was on the shortlist of people being considered to fill the vacant Supreme Court Judge seat. In a sense, this isn’t absurd at all, seeing as a handful of TV personalities are running the country. Sadly, the most unbelievable part of this story is that Trump would follow through on whatever hints or promises he made to Napolitano behind closed doors. Napolitano reportedly spoke excitedly and often about this prospect to his very patient friends, none of whom appear to have believed him at any point. Then one of them talked to Poitico about it. “He said, ‘Trump said I’m on the list,’” a source told Politico. “He’s been saying that since the transition.” The source said he and other friends warned Napolitano not to take the president at his word. Even once Trump released a list of potential Scalia replacements—a list that in no way contained Napolitano’s name—then nominated Tenth Circuit judge Neil Gorsuch, this brazen man went around claiming he is a “sleeper candidate.” Napolitano bragged that he submitted academic papers and a resume to Trump aides, as if anyone in the White House still reads. A source close to the White House told Politico, “The president already has a list of highly qualified contenders for future SCOTUS opens, and Judge Napolitano is not on it,” a sentence I never knew I wanted to hear so badly until this very day. On Tuesday, the Washington Post reported that Fox News had suspended Napolitano’s on-air appearances over another baseless claim—one Trump actually repeated publicly—that British intelligence officials spied on Trump at the behest of President Barack Obama.